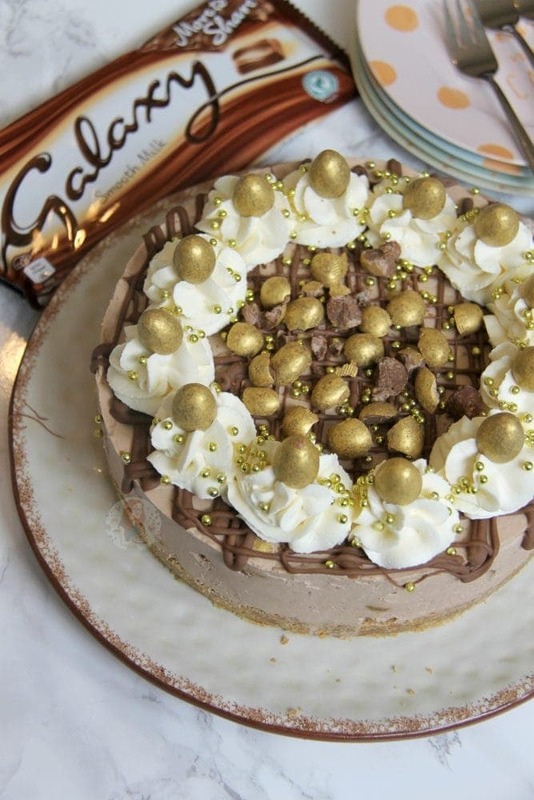 No-Bake Galaxy Golden Egg Cheesecake! 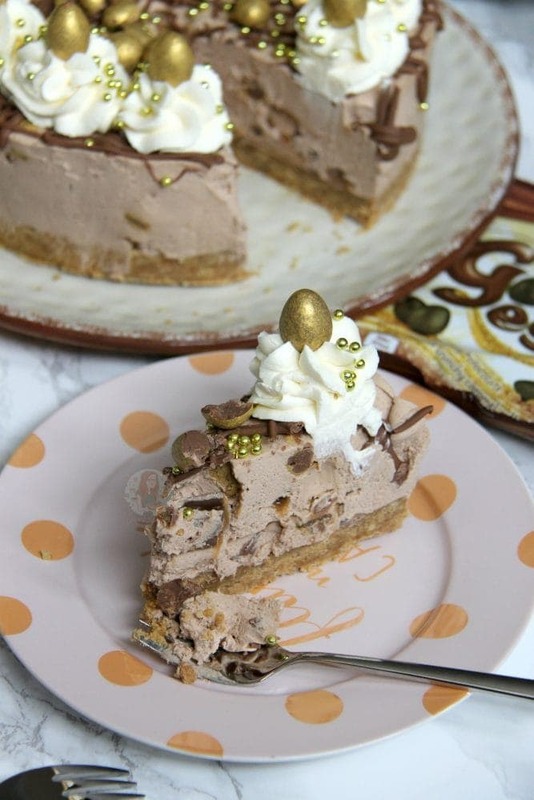 A Creamy, Chocolatey, Sweet, and delicious No-Bake Galaxy Cheesecake using Galaxy Golden Eggs. 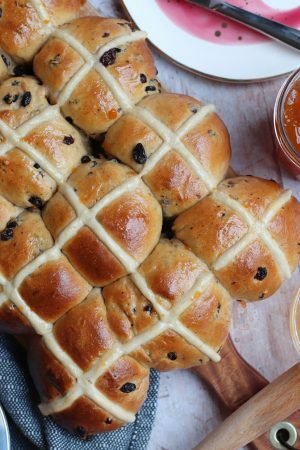 Perfect non-bake for Easter, or for any time of the year! Last year, I only discovered Galaxy Golden Eggs with two days to go before they stopped being sold. So, I was slightly heartbroken. I don’t even know why, but whenever I went into any supermarket, there weren’t any of these delicious beings! So therefore, I decided to go all out this year, and make a Cheesecake based on them. Based on the idea of my No-Bake Honeycomb Crunchie Cheesecake I decided to use Galaxy Chocolate itself as the chocolate to melt into the cheesecake, so it made it even more delicious. I used slightly more than usual and it set so much better! I then thought that using the Golden Eggs would be delicious… but as I found a bar of the Galaxy Collection Salted Caramel in my cupboard, I knew I had to add that too! Literally this cheesecake is a bit of a Galaxy mush. 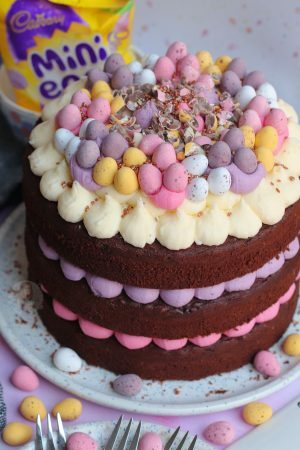 A classic Jane twist of a drizzle of Melted Galaxy Chocolate, Whipped Cream, Sprinkles and the chocolate of choice (Golden Eggs, obviously!) I was set. Honestly? This is genuinely of the best cheesecakes I have made. I LOVE IT SO MUCH. 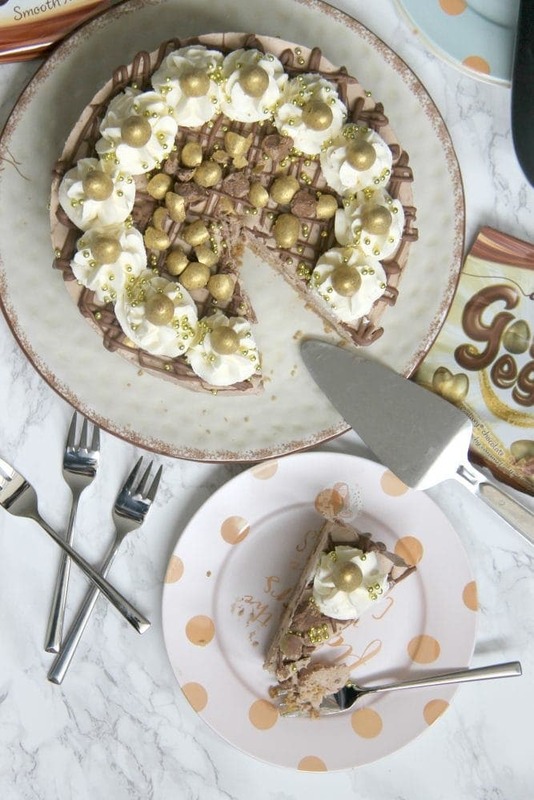 If you are more of a Cadburys kind of person, then check out my Cadburys Chocolate Cheesecake for sure – but this one is Galaxy through and through. It can really be used for more than Easter time, but its decorated with the wonderful Golden Eggs that I wish were available year round. The recipe is on my youtube channel in a vlog if you would like to see it made! 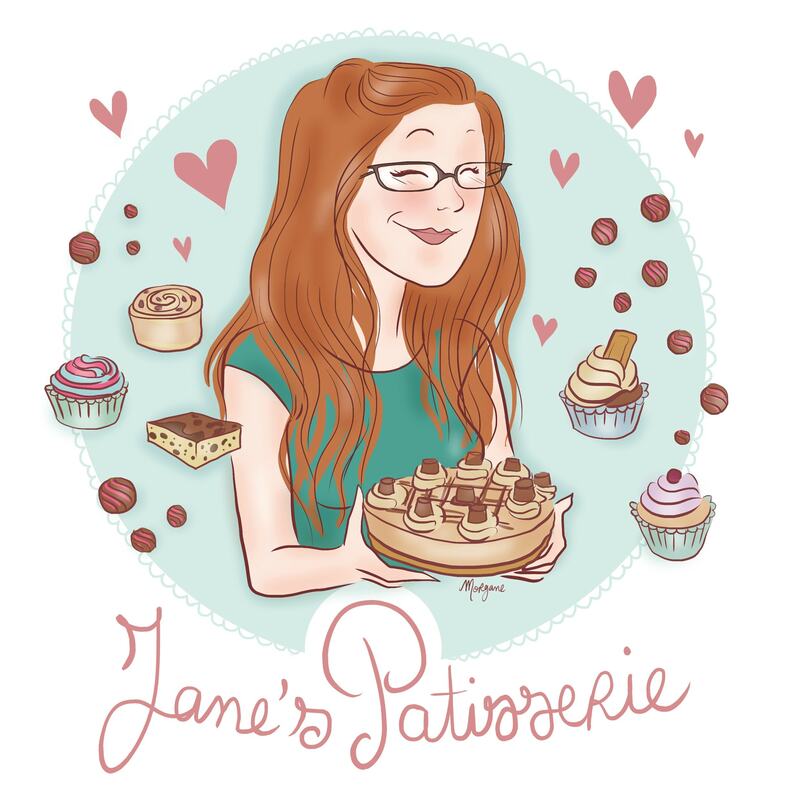 I have decided that after the hopeful success of my first Baking Vlog the other day, that I would do some recipes on youtube as well. I wasn’t sure if I was ever going to share this recipe on here originally, as it was just intended for youtube, but after countless requests I updated this post to include it. 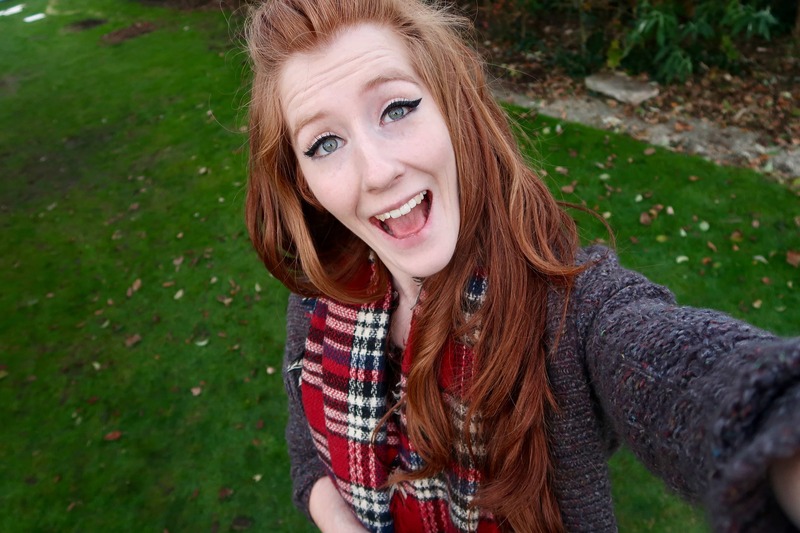 I realise the photos themselves are a bit sub par, but I haven’t had the time to photograph this beauty again! Blitz the biscuits in a food processor to a crumb. Melt the Stork/Butter and add to the biscuits! Press down into the bottom of an 8” DEEP Springform tin! Melt the chocolate in a microwave in short bursts until fully melted – leave to cool slightly whilst doing the rest. 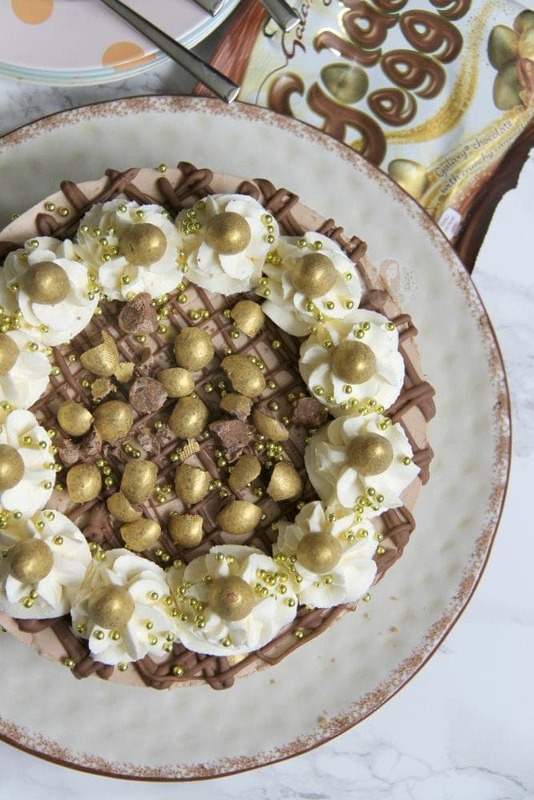 With an electric mixer, whisk the Cream Cheese, Vanilla and Icing sugar until combined – Add in the melted Chocolate and whisk again till smooth. Pour in the liquid double cream and continue to Whip the Cream Cheese/Cream Mixture until it thickens. 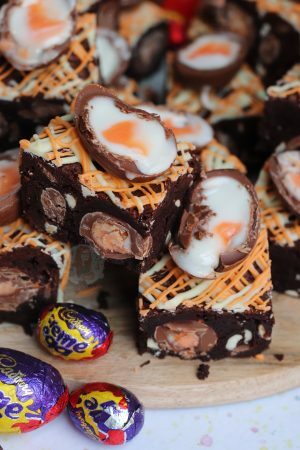 Fold through the Galaxy Golden Eggs and Salted Caramel bar – Pour the mix on to the biscuit base, smooth over, cover, and chill in the fridge for at least 5-6 hours hours or preferably overnight. 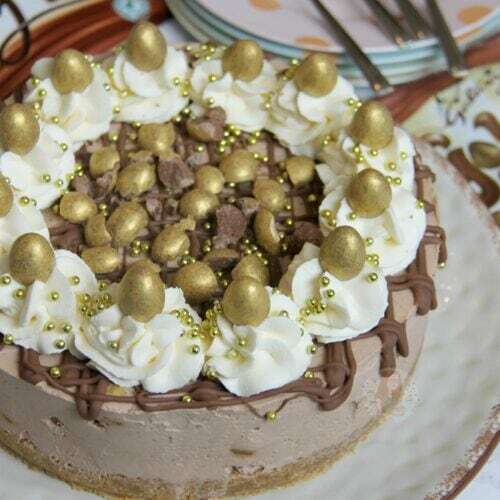 Remove the Cheesecake from the tin - Whip together the Double Cream and Icing Sugar to decorate the cheesecake with. Melt the 50g of Galaxy carefully to drizzle over the cheesecake. 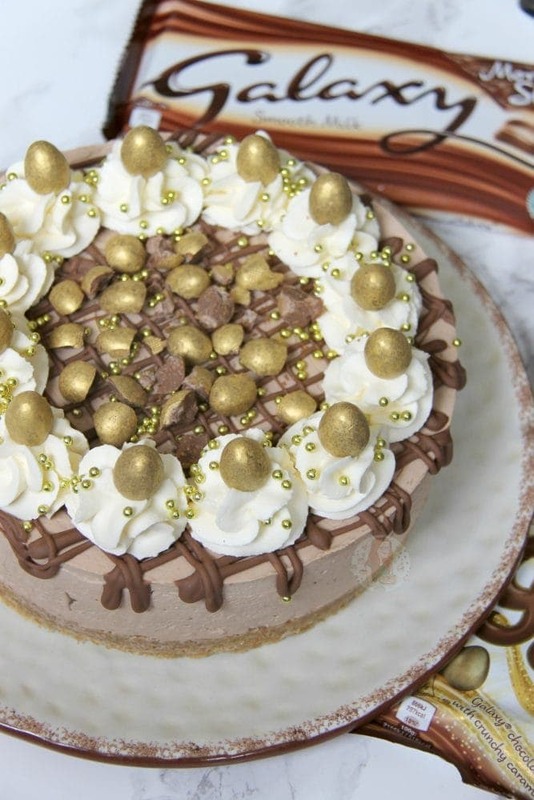 Decorate with the melted chocolate, the whipped cream, galaxy golden eggs, and sprinkles. This cheesecake will last for 3 days in the fridge! You can swap the Galaxy Caramel bar for the Caramel eggs if you prefer! You can leave out the Golden Eggs completely if you wish. You can swap the Galaxy chocolate for a basic Milk Chocolate instead if you want to make it cheaper! 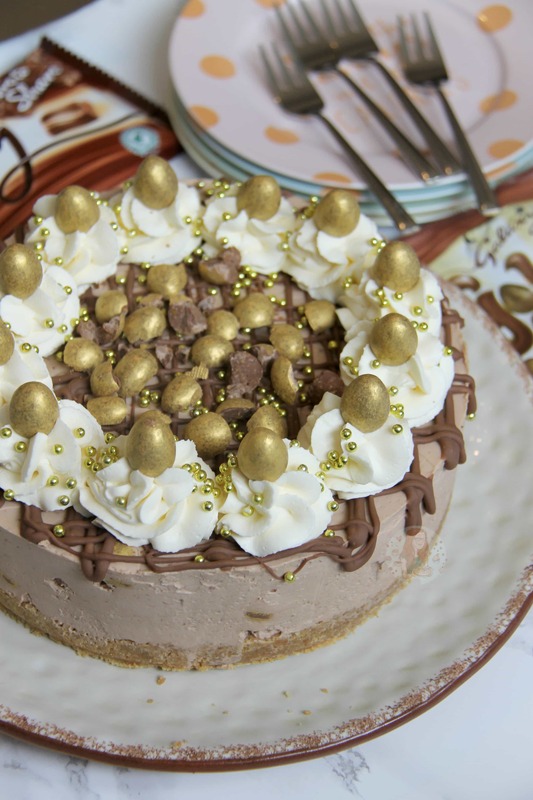 Find my other Cheesecake & Easter Recipes on my Recipes Page! Older Next post: Easter Chocolate Millionaires Shortbread! 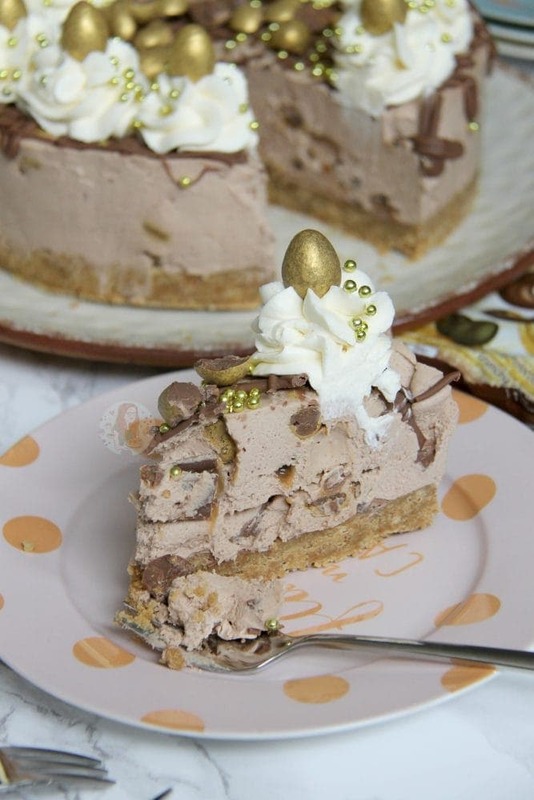 Newer Previous post: Individual Easter Nest Cheesecakes! Hi Jane what size tin did u use. If I made this into individual cheesecakes (cupcake tin? ), how many do you think it would make? Will it still set if I don’t add the chocolate bits in the cheesecake filling (aiming for fewer calories lol)? Also if I wanted to add a bit chocolate pieces, will the normal galaxy be ok? Sorry if I didn’t make sense. I ment will the cheesecake filling still set if I didn’t add the chocolate eggs and galaxy caramel chocolate pieces to the filling? Alternatively can I add little of the smooth galaxy choc pieces in the filling instead ? P.s thank you for your prompt response. Ahh okay yes, that would work! Hi Jane, do you know if a food processor would give similar results as a stand mixer making a cheesecake? Probably not, but I have never tried. Does your food processor have a whisk attachment? you could try that! How many packets of golden eggs did you use. Love the video! I love you recipies. Could you post the ingredients like you normally do? Makes it easier to go shopping for them! The video looks super handy for the method. Hiya – the recipe and method will be available on the video only. ?